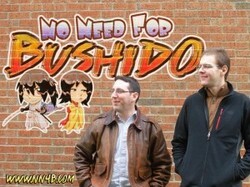 Alex Kolesar and Joe Kovell are the minds behind the long running samurai-based action-adventure webcomic: No Need for Bushido. Joe Kovell is the co-writer, website guy, and miscellaneous whatever doer, for No Need for Bushido. Joe wrote a couple jokes in the comic back in 2004 and has been coasting on that success ever since. Unbeknownst to many, Joe's alternate identity is that of mild-mannered website developer and graphic designer. He fights daily against the evils of old Internet browsers and bad design.